"I have raised a monument more lasting than bronze." apt description of the craggy forbidding terrain known as Gallipoli. of the Australian and New Zealand soldiers who died here. For the first time in history the common soldier has been remembered alongside their Generals. Soldiers were not previously held in the highest esteem.
" We have in the service the scum of the earth as common soldiers." Before him Frederick the Great of Prussia described soldiers as "the dregs of society" and in the time of Louis XIII they were perceived to be "'the bottom of the social heap". You will find no graves of the the 40,000 French casualties, 15,000 British and Dutch losses and approximately 7,000 Prussian fatalities who fought the famous battle of Waterloo on June 18, 1815 over a mere ten hour period. Here and there you will certainly find bronze statues of the Duke of Wellington. Then in 1917 Sir Fabian Ware founded the Commonwealth War Graves Commission. It's purpose was to mark and maintain the graves of the members of the forces of the Commonwealth who were killed, to build memorials to those who have no known grave and to keep records and registers, including, after the Second World War, a record of the Civilian War Dead. They have done so extremely well. "We can truly say that the whole circuit of the earth is girdled with the graves of our dead . 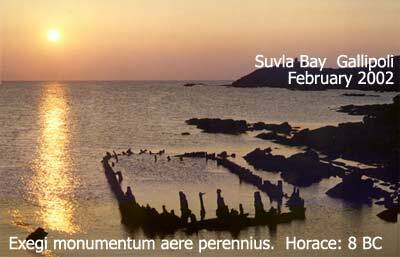 . . and, in the course of my pilgrimage, I have many times asked myself whether there can be more potent advocates of peace upon earth through the years to come, than this massed multitude of silent witnesses to the desolation of war." Contrast this perspective from 1922 with one of exuberance and challenge reprinted from 'The Town and Country Journal' May12th 1915. 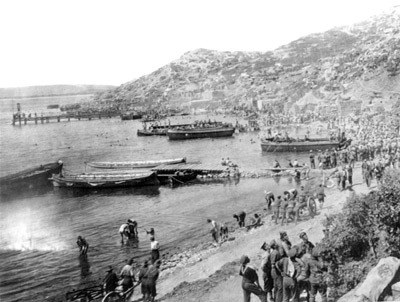 Mr. Ellis Ashmead-Bartlett's graphic account of the glorious deeds of Australians in the Gallipoli Peninsula has sent a thrill of pride throughout the whole Commonwealth. It was a great achievement to land in the dark on a coast where the enemy's strength was unknown, and, having driven the Turks back, to hold the country firmly, while reinforcements followed. Every one of those who are taking part in the action against the Turks will appreciate the words of General Birdwood, who said he could not sufficiently praise their courage, endurance, and soldierly qualities. Though the list of casualties has brought grief to many homes, there is consolation in the thought that all our men at the front are fighting gloriously for the defense of the Empire. Many more thousands of young men are giving their services, and in course of time will join their comrades in the battle line. And in the coming years the memory of all those who fought in the greatest war the world has ever seen, and in the severest crisis through which the Empire has ever passed, will be handed down from generation to generation with pardonable pride. 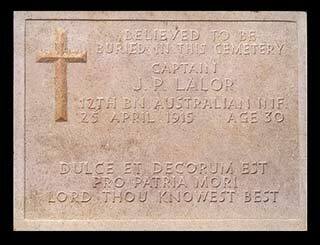 At Gallipoli in a cemetery at 'Baby 700', there is a headstone commemorating a man whose name is known to all Australians. It is but one of the many where the remains were not found and so marked.The Commonwealth War Graves Commission did find 925,000 of the 1,700,000 men and women of the Commonwealth forces who died in the two World Wars and marked their graves accordingly. "It is a sweet and Glorius thing to die for one's country". The British soldier/poet Wilfred Owen wrote a poem using this as the title. It is ironic that it is used to commemorate the grandson of the man who led Australia's single revolution at Eureka, Peter Lalor. Robert Rhodes James (Gallipoli 1965) describes J.P Lalor's assault on Baby 700: " The Australians were being virtually led by Lalor, a colourful personality even by Anzac standards; a deserter from the Royal Navy, he had served with the Foreign Legion and then got himself involved in a South American Revolution before returning to Australia to enlist in the army; clutching an old family sword firmly in his right hand, he was directing all operations from just above the Nek.....The summit of Baby 700 changed hands between the Turks and the Anzacs no less than five times." So the main thought that comes to me as we approach another 25th of April is that the wisdom expressed by a King in Flanders fields will go unheard. As will the expressions of monumental sadness from all old soldiers who have first hand experience of battle and the oppressive futility of war. It is said that those who do not learn from their mistakes are condemned to repeat them.